2. 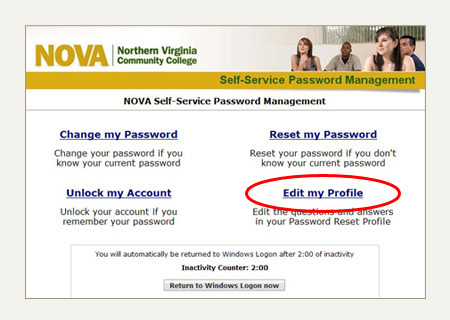 On the NOVA Self-Service Password Management page click on Edit My Profile. 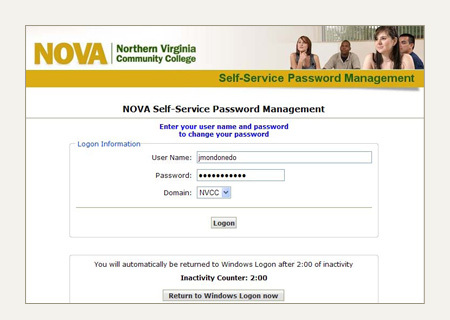 Enter your NVCC LAN user name and NVCC LAN Password. Click Logon. 3. Choose two questions from the drop down menus and answer them. Create a third question of your own with your answer for a total of three answered questions. Click Update to finish. 1. Click on Edit my Profile. 4. 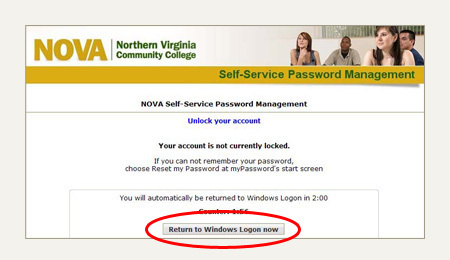 Click on Return to Windows Logon now. 1. 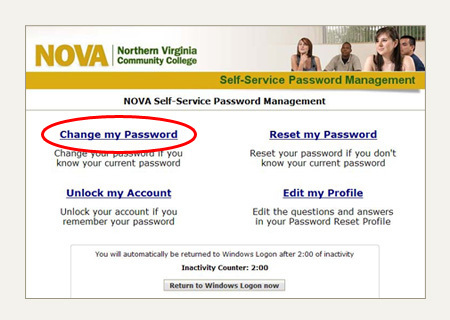 Click on Change my Password. select your domain and click on logon. 3. You can select Generate and click on “Generate Password” if you prefer the system to create your password, if you would like to enter your new password select Enter and type and retype your new password, then click on Change Password. 1. To use the Reset My Password tool from home to reset your NVCC LAN Password, go to https://pwreset.nvcc.edu. 2. 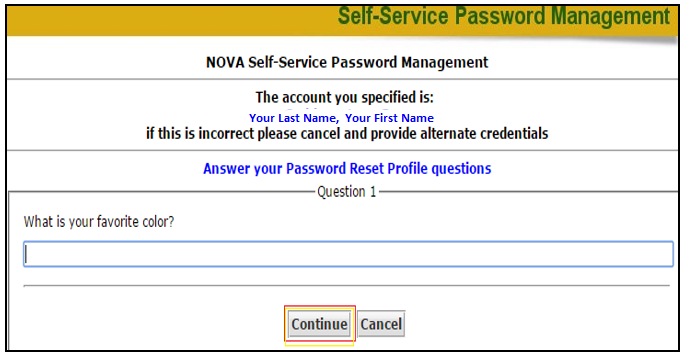 On the Self-Service Password Management page, click on Reset My Password. Enter your NVCC LAN User Name. Confirm Domain is NVCC. Click Logon. 3. 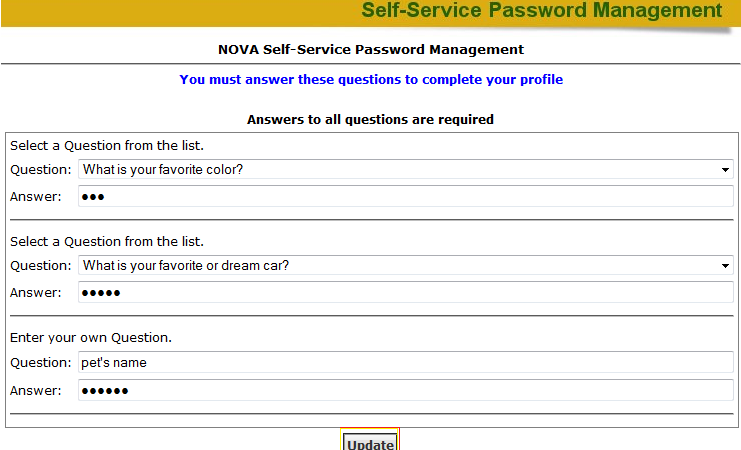 You will be prompted to answer all three of the Security Questions you previously set up. Click Continue until you come to the Set your new password screen. 4. At the Set your new password screen you will choose to either generate an automated, random password OR enter a password of your own. Click the radio button for Generate. 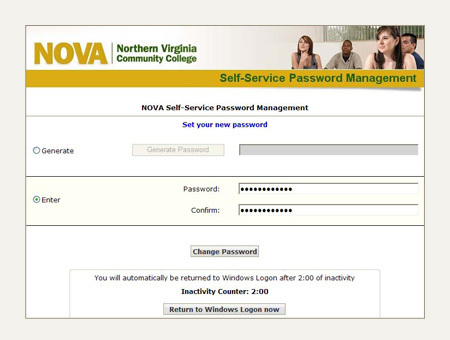 Click on the Generate Password button. Your auto-generated Password will appear in the next field (ex. river53). Lastly, click on the Reset Password button. 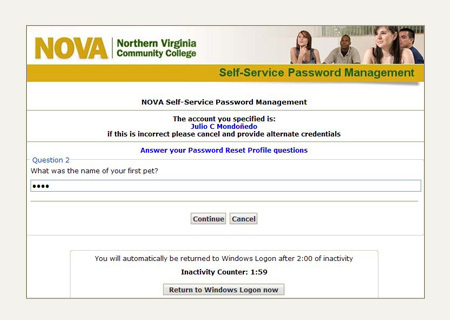 Wait 15 minutes before logging in with your new password. Click the radio button for Enter. Key the password of your choosing into the Password field. Enter that password again in the Confirm field. Lastly, click on the Reset Password button. Password Criteria: Eight characters total including at least one capital letter and at least one number. 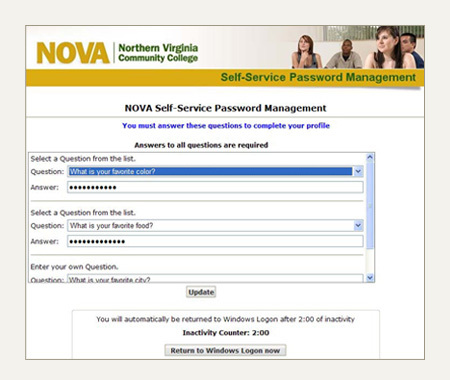 Wait 15 minutes before logging in with your new password. 5. Once you have successfully completed the Reset myPassword process you will receive a message that Your Password has been Reset! 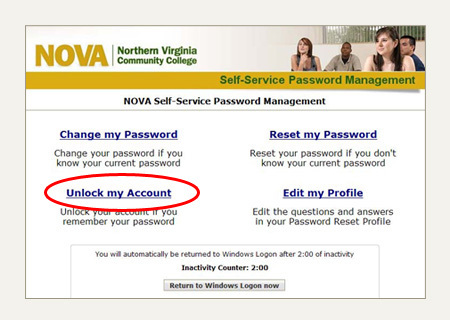 You must set up the myPassword tool from your on-campus computer BEFORE you can use it to reset your password from home. 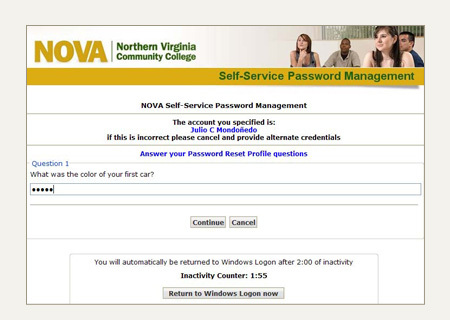 Wait at least 15 minutes after resetting your password before logging in. 2. Type your user name and select your domain, then click on Logon. 3. Answer the questions that you previously created, then click on Continue.